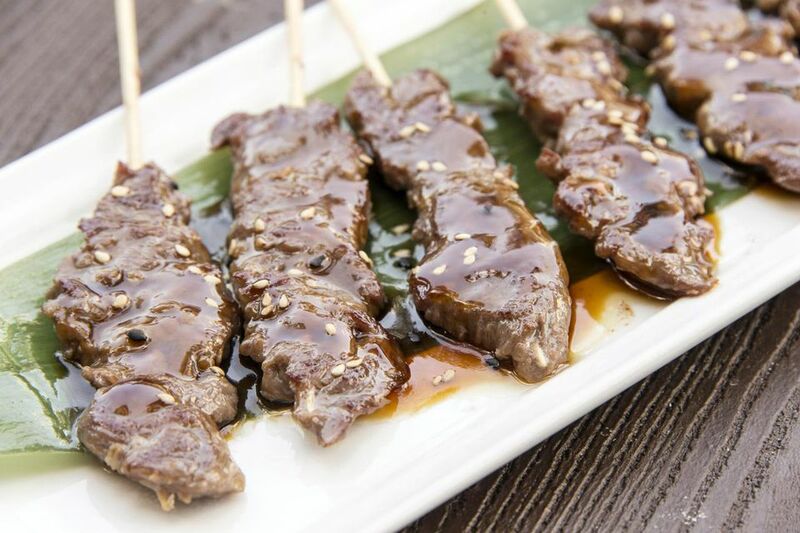 This authentic beef satay recipe will blow you away with its abundant flavor and tenderness. The secret to good satay is all in the marinade, and this satay marinade is simply the best. It has been passed down through families in Thailand and Malaysia over many generations. This aromatic marinade features a special blend of fresh herbs and spices, yet it's very easy to make: you simply place all ingredients in a food processor. Cook your satay on an outdoor grill or in the oven. Either way, it's simply fantastic! If using wooden skewers, soak them in water (to prevent burning) while you prepare the meat. The kitchen sink works well for this. Place all marinade ingredients in a food processor, large chopper or blender. Process well. Taste-test the marinade - you will taste sweet, spicy and salty. The strongest tastes should be sweet and salty in order for the finished satay to taste its best. Add more sugar or more fish sauce (in place of salt) to adjust the taste. You can also add more chili if you want it spicier. Place beef in a bowl, pour the marinade over and stir well to combine. Cover and marinate at least 1 hour, or longer (up to 24 hours). When ready to cook, thread meat onto the skewers. Fill up to 3/4 of the skewer, leaving the lower half empty so the person grilling has a "handle" to easily turn the satay. Grill the satay on an outdoor grill, basting the first time with a little of the leftover marinade. To cook satay indoors: place satay on a broiling pan or baking sheet covered with aluminum foil. Set oven to broil and place satay close beneath the heating element (second-to-top rung works well). Turn the satay every 5 to 6 minutes until done to your liking (15 to 25 minutes). Serve with rice and Easy Satay Peanut Sauce for dipping.